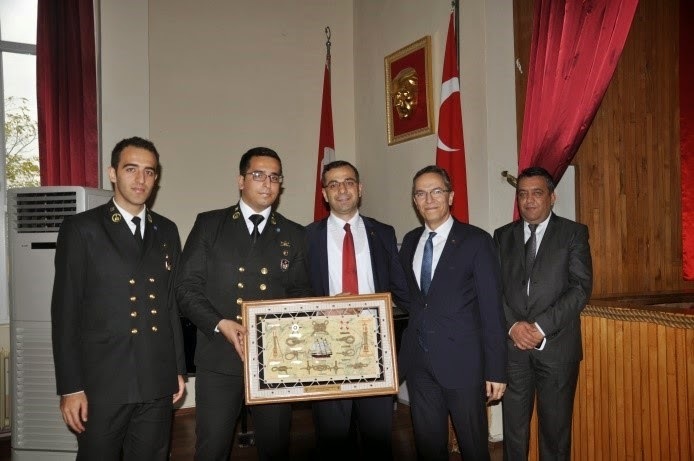 YASA SHIPPING,which is prominent shipping company of the sector was hosted in Carrier Days that is getting enormous attention.YASA SHIPPING was represented by Deputy Personnel Manager Göktan GÖKALP, Deputy Personnel Manager Muammer BIÇAKÇI, Deputy Manager Razaman ÖZCAN. Conference which is start with presentation of their company continiued with introduction about firm to the students. They emphasized that they had given importance to education professionalism as a company and underlined that, professionalism could be achieved with education.At the end of the conferance, Dean Nil GÜLER gave a vote of thanks speech aimed at Career Club’s organisations. After the conference, representatives and students joined the cocktail party, where they were informed more about YASA SHIPPING. After this sincere cocktail party, Mr.GÖKALP, Mr. BIÇAKÇI and Mr.ÖZCAN showed their goodwill and left the campus. The 19th Annual Career Days organized by the Istanbul Technical University Maritime Faculty Career Club hosted Active Shipping today. Active Shipping was represented by the personel manager Aras Bilge AKSÜYEK and operation manager Bülent UYGUN.Active Shipping have been including in maritime sector since 1993. Today, Active Shipping has 9 ships. In the conference, Personnel Manager Aras Bilge AKSÜYEK, Operation Manager Bülent UYGUN represent the company on the career days. Conferance started with introduction of the company. Active Shipping which attach importance to education said, in case of officer and engineer applicants do their internship in this company, on their job carriers they have gain many advantages. On the other hand before the interns join the vessels 2 weeks of course are given them, officers are taking that course in not only company office but also croatia. In regular time interval seafarers take courses in Crotia Singapore and Philippines for 3-4 days. After the conference, representatives and students joined the cocktail party, where they had opportunities to ask their own questions about Active Shipping. The 19th Annual Career Days organized by the Istanbul Technical University Maritime Faculty Career Club hosted UN RO-RO on November 18. UN RO-RO representatives Murat Ozcelikyurek and Pınar Curnallok introduced themselves and their company in a speech to students, underlining that the company is experiencing day-by-day improvements. The company officials also discussed the positives of working on ro-ro ships. The representatives ended the conference after answering students’ questions about the company. After the conference, a cocktail reception was held by ITU MF Career Club with the company representatives and maritime faculty and students, providing students an extra chance to ask company representatives about the company. 19th Annual Career Days that has been being organized by İstanbul Technical University Maritime Faculty Career Club, hosted Akmar Shipping. Akmar Shipping was represented by Personnel Manager, Özge Ataman and Operation Manager Tarık Gürsoy. Ms. Ataman and Mr. Gürsoy started their speeches with the introduction of their company, which was established 37 years ago and has most developed agency at bosphorus of Turkey, to the students. 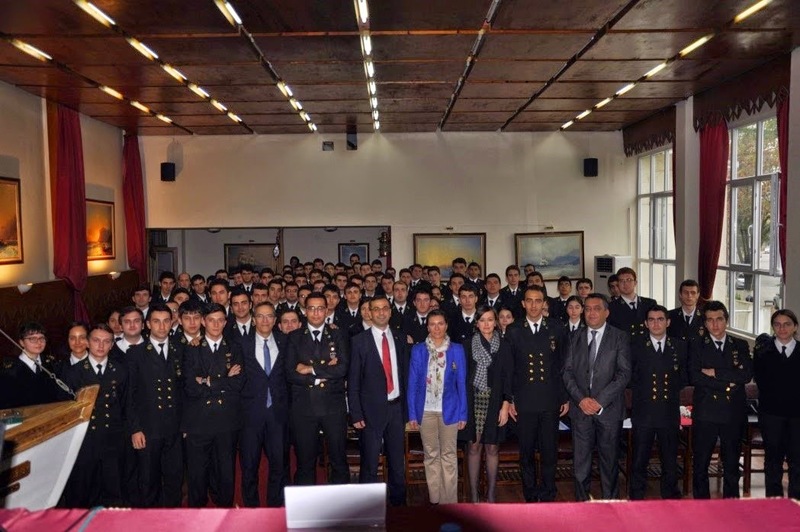 Ms. Ataman who mentioned recruitment procedure of officers and cadets, talked about possibilities at ship. After the Q&A part with the students, they advised that, student should make their career path during the college years and they restated that they should improve themselves. After the conference, the representatives and our students joined the cocktail party, where they were informed more about Akmar Shipping. After this sincere cocktail party, Ms.Ataman and Mr. Gürsoy showed their goodwill and left the campus. Chemfleet was the eighth guest of the 19th annual Career Days organized by the Istanbul Technical University Maritime Faculty Career Club. Operation Manager Baris Samur, Personal Manager Ozgur Sarioglu, Vice Personal Manager Mahir Adali, Safety Manager Gokhan Ergin and Technical Manager Ersen Ucakhan participated in the organization as the representatives of Chemfleet. Samur and Sarioglu introduced their company to the students, and Sarioglu explained the company’s cadet policy. Moreover, the company representatives talked about Chemfleet’s safety procedure in chemical tanker.Ergin notice that company gives importance safety especially in chemical tankers and Chamfleet’s chemical tankers completely dependable for mariner’s health situation thanks to safety procedure. Furthermore, Samur announced good news that Chemfleet will be increase number of tanker in this year. After the conference, representatives see off by Career Club Members. The 19th Annual Career Days which have been being organized by the Istanbul Technical University Maritime Faculty Career Club hosted ARKAS LINE Management today. The Personnel Manager Ferit GÖKDENİZ, Deputy Personnel Managers Ahmet Recai Bayramoglu and Esen Eren Çaglayan, Training Specialist Aliye Handenaz Gülşen and Transportation Manager Ersin Akşit met with students in the maritime faculty. In the beginning of the conference, Ferit GÖKDENİZ introduced the company and attracted the attention of our students that mission of ARKAS LINE is to provide a first class maritime management. In the middle of the conference, Ferit GÖKDENİZ shared that the trainees in the company are satisfied with the training policy which he explained in detail. The represantatives of the company ended the conference after they answered questions which maritime faculty students asked. After the conference, the representatives and the students joined the cocktail party organised by the Career Club, where they were able to give the students more information about ARKAS LINE. At the end of this meaningful talk and the cocktail, the reprasantatives left the school. The 19th Annual Career Days which have been being organized by the Istanbul Technical University Maritime Faculty Career Club hosted Zenith Ship Management today. Zenith Ship Management was represented by the personel manager Barış Ziya KAYA and inspector Mehmet ÖNEN. In the conference, our guests who talked about various subjects associated with the company said they are a wholly owned affiliate and they work together with Scorpio Group, one of the world's leading shipping companies. As well as this, they also told that customs which belonged to Dünya Shipping haven't changed. They also expressed they manage 13 ships and they are going to manage one more ship in December, 2014 and 6 new ships in June, 2015. Barış Ziya Kaya emphasised opportunities about ship training is always available for students studying in maritime faculties. After the conference, representatives and students joined the cocktail party, where they had opportunities to ask their own questions about Zenith Ship Management. 19th Annual Career Days, organized by İstanbul Technical University Maritime Faculty Career Club, hosted Geden Lines today.In 1975,Geden Lines which was established for marine industry,charter and agency servises,have fleet which consist of bulk carriers and tankers.The Company has based on Çukurova Holding since its founding. 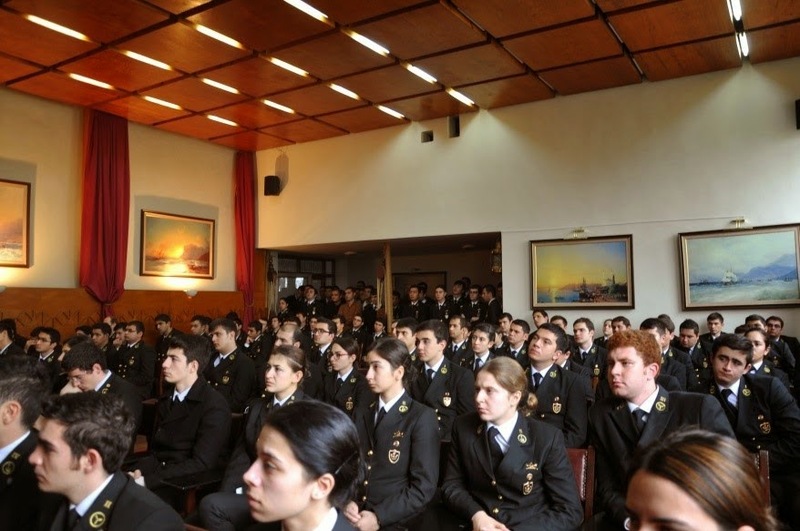 Geden Lines was represented by Personnel Managers Kadir ÖZKAN,Şükrü DİLEK, and Fatih TÜRKER..Firstly,Company officials staged an interview for some of the cadets. After that, Mr.ÖZKAN, Mr.DİLEK and Mr.TÜRKER who started the conferance ,gave information about the company and answered students' questions which about the company and training on board. Company officials who gave information about the deficiencies in the maritime education and the sector , finished the conversation. After the conference, representatives Mr. ÖZKAN, Mr.DİLEK and Mr.TÜRKER who wrote their opinions for the Career Club of ITU Maritime Faculty on the journal ,left the campus with their best wishes.. The 19th Annual Career Days organized by the Istanbul Technical University Maritime Faculty Career Club hosted Tersan Shipping today as the 4th guest. Training Superintendent Tanyel Tekin, DPA Deniz Taneli, Human Resource Coordinator Bora Yetiş and Safety Departmant Officer Seda Alp Arca participated in the symposium as the representatives of Tersan Shipping. Tanyel Tekin started their speeches by introducing their company to the students. Tersan Shipping , which has 7 tankers , is a chemical tanker company. Moreover ; they are aim to cadet on board on every tankers. Tanyel Tekin gaves information about the rising of company in addition, they want to work with chemical tankers.They gave information to students about M/T Basat which happened pirates attack. After the conference, the representatives and our students joined the cocktail party, where they had opportunities to ask their own questions about Tersan Shipping.